Whether it’s to support millions of broadband users or developers building products on cloud-based platforms, internet companies need infrastructure to support their business. Increasingly that means building their own, as recent news from Microsoft illustrates. Writing on its Azure blog, Microsoft says it has significantly invested in subsea and terrestrial dark fibre capacity spanning multiple oceans over the last nine months. The company has entered into submarine cable deals across both the Atlantic and the Pacific. “During Microsoft’s latest earnings we shared that the Commercial Cloud division, which includes Azure, Office 365 and other services, grew 106 per cent, and as we expand our cloud services and global infrastructure, we need a strong subsea strategy to ensure our customers experience high availability access to their data,” Crowley wrote. The news also reflects the fact that spending on optical systems by Internet content and cloud provides like Google, Facebook and Microsoft has been growing substantially over the last few years (see Search engines of change). The deal with the Hibernia Express cable gives Microsoft connections from the US and Canada to Ireland and the UK, when the cable goes live in September. 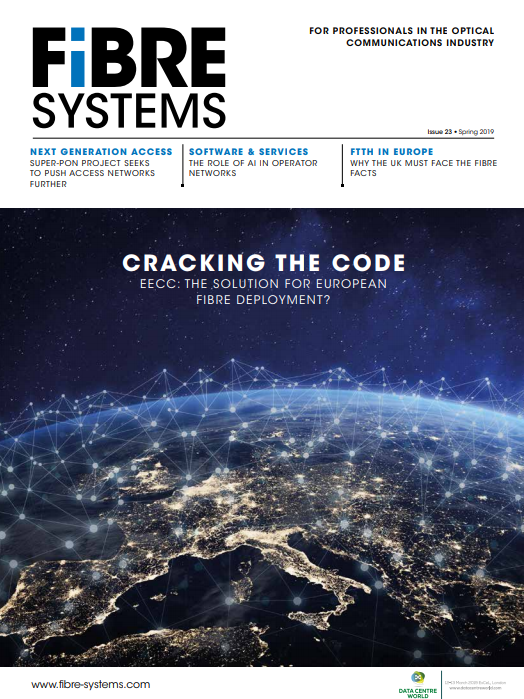 Hibernia Express has some fibre pairs optimised for low-latency operation – the promise is under 60 milliseconds between New York and London – and has a total design capacity of over 53Tb/s. Microsoft also announced that it is the foundation customer on the upcoming AEConnect cable between New York, and the West Coast of Ireland. The cable, which will cost about $300 million to build, uses 130 wavelengths x 100Gb/s per fibre pair, and will provide the basis for Microsoft’s network expansion in Europe. AquaComms also owns and operates CeltixConnect, a 72-fibre pair subsea cable that will provide onward connections from Dublin to London. Microsoft has also revealed that it is the US-based investor in the New Cross Pacific (NCP) cable system, a consortium that also includes China Mobile, China Telecom, China Unicom, Chunghwa Telecom, and KT (Korea Telecom). Construction has just started, with TE SubCom as the cable supplier. As part of its participation in the consortium, Microsoft will invest in its first physical landing station in the US connecting North America to Asia. The 100G repeatered cable system will provide up to 80Gb/s of capacity between Hillsboro, Oregon, and the China mainland, Japan, South Korea, and Taiwan. New Cross Pacific will be designed to interconnect with other cable systems in the region, with the expectation for the service to launch in late 2017. Last year, Microsoft agreed to purchase capacity on a Seabras-1, a subsea system being built by Seaborn Networks, and the first cable to connect Brazil and the US directly (see Partners Group funds Seabras-1 cable linking US and Brazil).